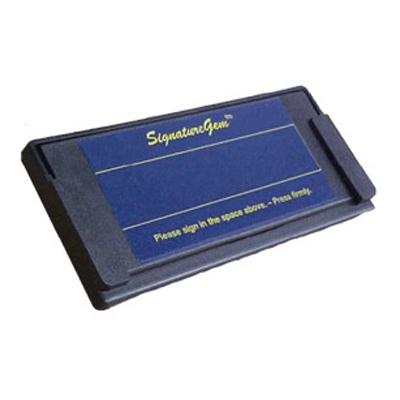 KioskGems are a ruggedized electronic signature pad for use in public-access or unsupervised kiosk environments. The signature tablet bolts to a housing with no exposed fasteners and the pen is tethered with a steel cable rated at 470lbs. 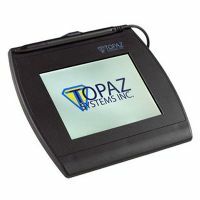 KioskGem™ LCD 1x5 is a ruggedized electronic signature pad for use in public-access or unsupervised kiosk environments. The durable tempered glass window protects the electronic LCD screen, which displays "electronic ink" under the pen tip in real-time as a user signs. The unit can be affixed to a surface from the underside with no exposed fasteners, and the pen is tethered with a steel cable rated at 160 lbs. 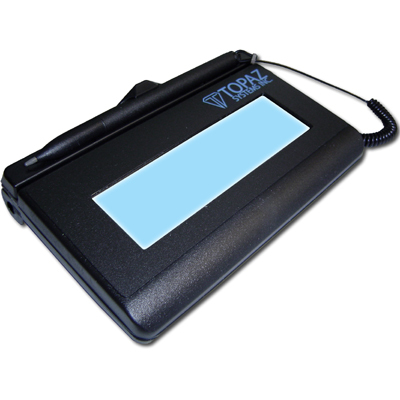 KioskGem™ 1x5 is a ruggedized electronic signature pad for use in public-access or unsupervised kiosk environments. The signature tablet bolts to a housing with no exposed fasteners, and the pen is tethered with a steel cable rated at 160 lbs. These models show the signature on the computer screen.